They say all good things must come to an end, although for TaylorMade, the announcement that Sergio Garcia will be leaving the brand after a decade and a half as their key poster boy flies in the face of recent momentum. After all, Rory McIlroy was signed earlier this year to join a collection of five other players who, in the aftermath of Garcia’s triumph at Augusta in April, all took their place in the top 12 of the world rankings. An eclectic, star-studded lineup if ever there was one, but, as of Monday, they’re down a Spaniard who boasts 19 professional wins and a world ranking of 2 at one point since being added to the TaylorMade books in 2003.
being a number of years remaining on Garcia’s contract. 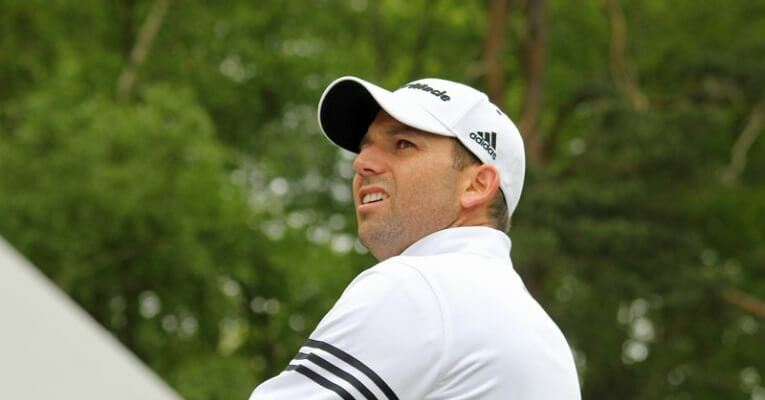 “Today, after a memorable 15-year partnership with Sergio Garcia, we have mutually agreed on a release from the remaining years of his TaylorMade contract,” a TaylorMade spokesperson was quoted as saying. Garcia himself has yet to make a public statement at the time of writing, but it hardly comes as a shock, given his less-than-subtle dalliance with Callaway in recent weeks. Specifically, he was seen using putters made by Odyssey Golf and Toulon design during the FedEx Cup playoffs, while at the British Masters he was snapped hand in the cookie jar with a Callaway MD4 wedge. Callaway have kept their counsel thus far, but it is widely expected that he will be unveiled as their latest big-name signing at the end of the year. Indeed, that will represent a great coup should it eventuate. You get the impression that there won’t be any hard feelings on the part of TaylorMade either, who undoubtedly find themselves at a bit of a crossroads. A bit of a surprise was sprung in May when it was announced that KPS Capital Partners had acquired the company, and one imagines that with a wage bill including the likes of McIlroy, Jason Day, Dustin Johnson, Justin Rose and Jon Rahm, the new owners were probably keen to trim some of the fat. One also wonders whether there were just too many cooks spoiling the broth, and whether Garcia had suffered a bit of a blow to his pride. After all, he has been their leading light for much of his time with TaylorMade, so it isn’t a great stretch to believe he wasn’t wholly comfortable being crowded out by bigger names. It is interesting to note that the TaylorMade M2 driver was one he used to particularly good effect at Augusta, and the man himself acknowledged the role of this club in his famous victory. His season has been steady, rather than exceptional in the months since, but one shouldn’t underestimate what he is leaving behind, and the teething issues that may arise as he makes the switch. Nevertheless, with one major now in the bank, and an insatiable thirst for more acquired, perhaps this is the change Garcia feels is necessary to inspire him to kick on, and really make the most of the latter part of his career. Both he and TaylorMade will no doubt reflect on a lot of success in partnership together, and perhaps also on a couple of near misses and what could have been too. Either way, an era has truly come to an end, and the page will be turned to a new chapter. Will he emulate, or even exceed his past successes with TaylorMade? It will be fascinating to observe his progress – not to mention that of his former equipment supplier too.